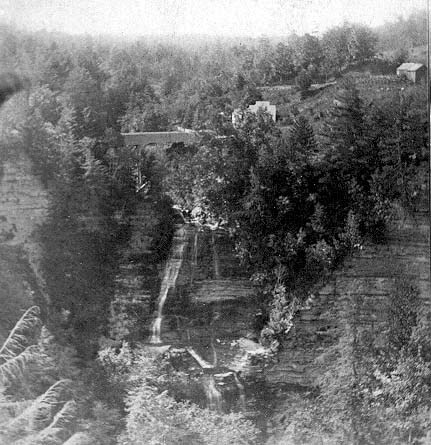 "824 View across the River"
Mr. Letchworth and his Nameless Club from Buffalo christened Erickson's Brook as the more romantic Deh ga ya soh or "Nameless Spirit" Creek a few years before this photograph was taken. Although not visible in this stereo, there were a series of steps down the cliff so that visitors could reach the River. See Image 43 and Image 44 for later Deh ga ya soh bridges.